I’m convinced that this gluten free granola recipe sold our last house. Before moving to the Hudson Valley years ago, we lived in Connecticut for a stint, which, for a number of reasons, wasn’t a good fit for us. We tried to sell the house when I became pregnant with Ella, but without any luck (did I mention the housing market had just bottomed out?). A year and a half later we gave it another go. 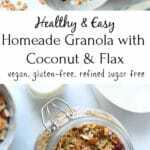 I was baking a batch of this granola when some prospective buyers unexpectedly stopped by with their realtor to see the house. I threw the bowls in the sink, grabbed a timer, gathered up a very sleepy Ella (who had been napping) and our rambunctious dog, and set out for a walk. By the time we returned the granola was ready to come out of the oven, and within a few hours we had an offer on the house. The for-sale sign hadn’t even gone up yet in the front yard. Who can resist a home that smells irresistibly like toasted nuts, oats, cinnamon, vanilla and coconut? 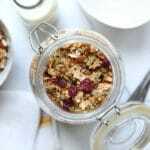 This gluten free granola recipe has been a Sizemore staple for years. 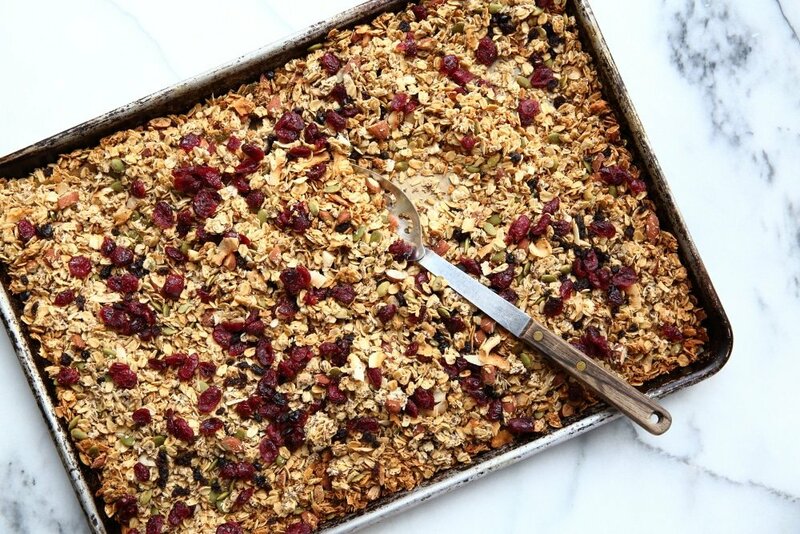 James is an avid granola eater, and I developed the recipe after becoming fed up with the overly expensive and overly saccharine grocery store granolas, which often cost upwards of $6 a bag, last only a few days and are loaded with sugar. 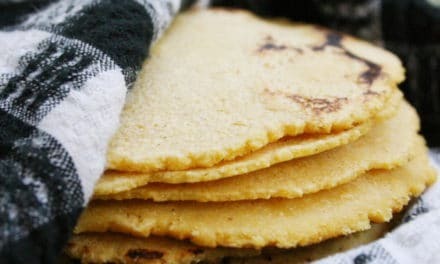 This version is filled with wholesome, healthy ingredients, is lightly sweetened with honey (or a mix of honey and maple syrup) and is flavored with almond extract and vanilla. It’s subtly sweet, crunchy, and, in our opinion, it’s perfection. I’ve tinkered with the ingredients slightly over time (the original version was featured in the Green Market Baking Book), swapping out wheat germ for nutrient-dense flax and chia seeds. 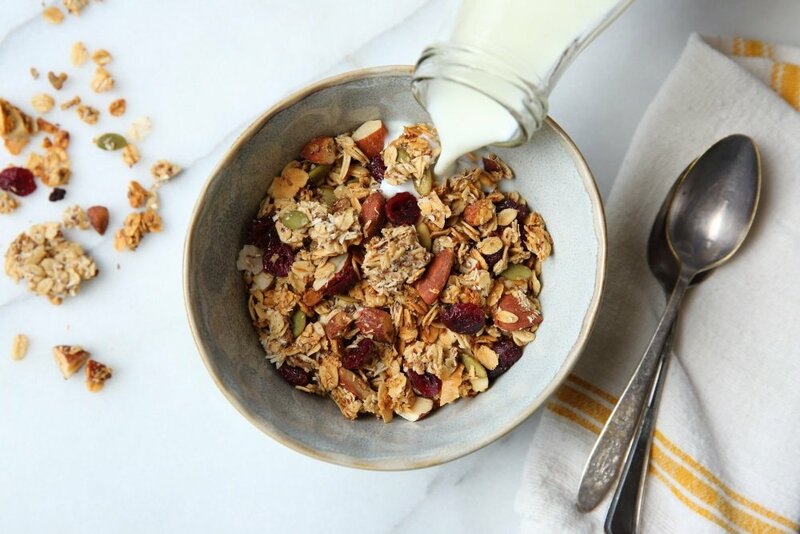 After the granola is cooked and cooled, we mix in dried fruit—you can use anything you like or have on hand, think dried cherries, cranberries, apricots, currants and/or raisins (I particularly love cherries and currants). James has become the resident granola baker in the house, and he throws together a batch every couple of weeks, which we sometimes swap out for this millet and buckwheat version or these crunchy granola clusters. 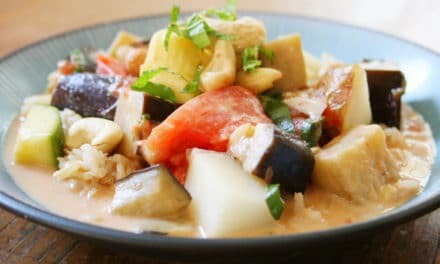 He eats it with almond milk for breakfast, Ella and Juni love it with plain yogurt as a snack, and I often sprinkle it over roasted fruit with a dollop of unsweetened whipped cream for a quick mid-week dessert. It also makes for a great hostess or thank you gift when packed into pretty jars. If you can’t eat gluten, be sure to buy gluten-free rolled oats (regular oats are processed in wheat facilities and can contain traces of gluten). Use a large rimmed baking sheet like this (also called a half sheet pan), which is a serious workhorse in my kitchen (I have five!). If you don’t own one this size, use 2 smaller pans. Use a rubber spatula to press the granola into an even layer, helping it to cook evenly and form small clusters. I like to store this granola in half-gallon Ball jars. 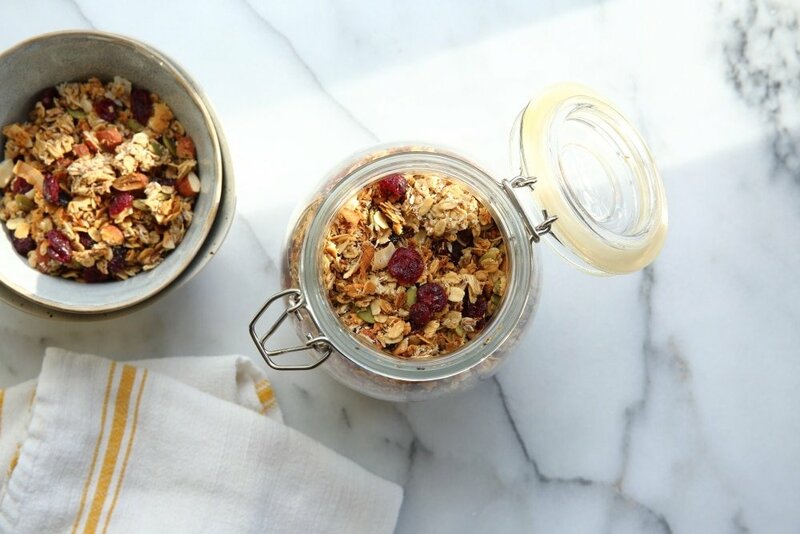 If you’re gifting the granola, these quart-sized glass containers make for pretty gifts. For me, there are few aromas that are as enticing or welcoming as homemade granola baking in the oven—toasted oats and nuts, cinnamon, vanilla, almond and a hint of coconut… irresistible. 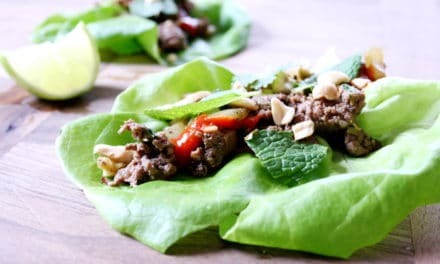 This healthy, fiber-rich recipe is packed with wholesome ingredients and is lightly sweetened with honey (or you can use maple syrup or a mix of both). It comes together easily and makes a batch that’s big enough to last weeks. 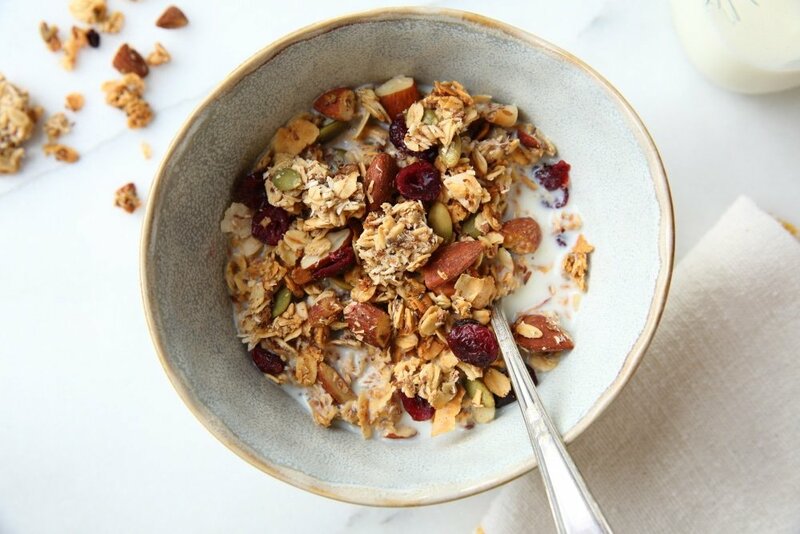 Be sure to let the granola cool completely before adding the dried fruit (you can use any dried fruits you like, although I’m partial to cherries and currants). Enjoy the granola with milk or yogurt for a healthy breakfast or snack, or sprinkle it over roasted fruit or frozen yogurt for a delicious and nutritious dessert! In a large bowl, mix together the oats, flax seed meal, chia seeds (if using), shredded coconut, coconut flakes (if using), pumpkin seeds, nuts, cinnamon and salt. In a small bowl, combine the coconut oil, honey and/or maple syrup, vanilla extract, almond extract and boiling water. Whisk until smooth. Pour the wet ingredients over the dry ingredients and stir until evenly coated. Spread the mixture onto a large rimmed baking sheet, and press it into an even, compact layer. Bake 30 minutes, then stir gently. Bake 15 to 20 minutes longer, or until the granola is toasted and golden (at this point your kitchen should smell amazing!). Cool completely, then sprinkle the dried fruit over top. 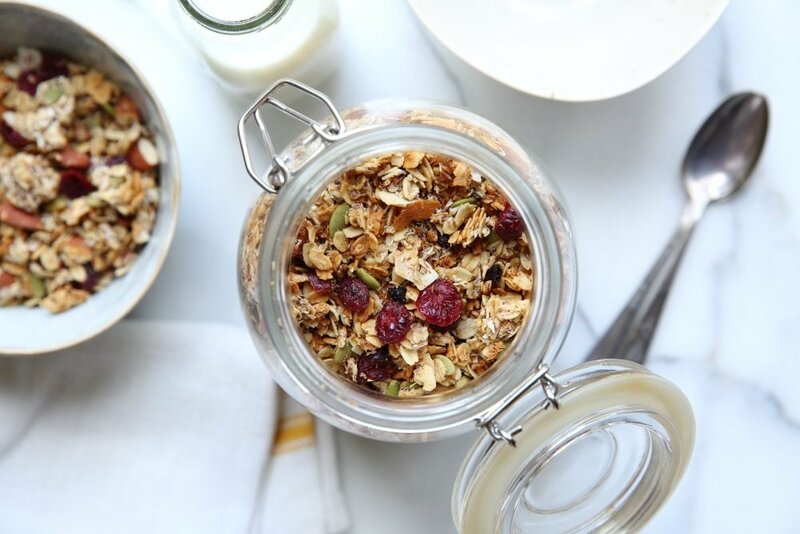 Do Ahead: The granola can be stored in an airtight container at room temperature for up to 3 weeks. Love the story about selling your house. Hope you are well!